Know your limits. Birthday parties can be stressful enough as it is without trying to win a medal for “mother of the year” and making the best cake in the world. 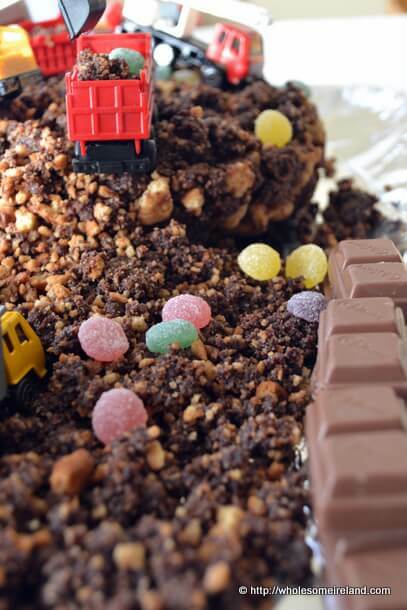 So if you have a child who is obsessed by trucks or building sites this is the perfect building site cake with no baking! I know my limits. I knew back in August that the requested “minion cake” for the 14 year old was never going to happen. Simply because I cannot work with sugarpaste. I don’t have the patience, space or time to do it. There are a million other things that I have to do, I sabotaged myself royally with her jellybean rainbow cake for her 13th Birthday last year. I relinquished control of the kitchen and allowed her to bake her own cupcakes for herself instead. That was not easy, nor was the cleanup afterwards. This time last year I was blogging about that spaghetti meatballs cake, this year it’s a building site. Because this cake requires no baking, the smallies can help you the whole way through with a little supervision. As a cake, it’s very frugal. It serves between 12 and 16 people, maybe more if you’re stuck. 500g packets of digestive biscuits are reduced to €1 in Tesco at the moment and you’ll only need one of these to make the cake. The rest of the ingredients come to about €3, including the chocolate and jelly tots I used for decoration. 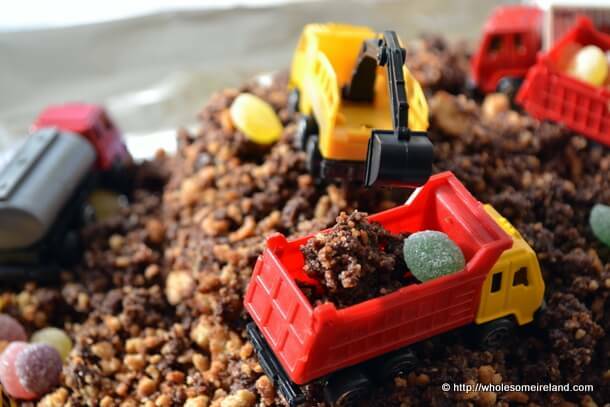 So for €4, it’s just 25c per portion for small pieces, excluding the trucks below. The biggest single cost I incurred was buying the trucks. I got 2 packets of building site themed toys in the local discount shop. They were €1.50 each and granted I could have got away with just 4 but 8 is loads and if you’re hosting a Birthday party it might be a good idea to pick up enough so that you can give each child a toy from the cake on the way home. The Birthday Boy assisted in the truck placement and really the key to making the cake is not to become obsessed about how it looks to you, it’s about appealing to a child’s imagination, not yours! Take 2 large heavy duty sandwich bags and put one inside the other. Fill the inner bag with the digestive biscuits and channel the anger in your life at the moment batter the bejeepers out of it with a rolling pin or wooden spoon. Get a big heavy bottomed saucepan, stick it on top of a weighing scales and measure out the butter, golden syrup, caster sugar and cocoa powder directly into the saucepan. Put the saucepan on a medium-low heat on the hob and stir occasionally. Line a springform cake tin really well with cling film (I used a 21cm tin). Line a baking tray with cling film. Once the contents of the saucepan have turned to a liquid and the sugar has completely dissolved, pour in the crumbled biscuits. Stir well until they are well coated with the liquid. Take 2/3 of the coated biscuit mixture and press it firmly into the lined cake tin. Cover the top with cling film and leave to cool to room temperature and then stick it in the fridge for about an hour or so. Take the remaining 1/3 of the biscuit mixture and spread it out on the lined baking tray. Break it apart with a fork. To assemble the cake. Line a large board or tray. Tip the chilled cake out onto the tray. 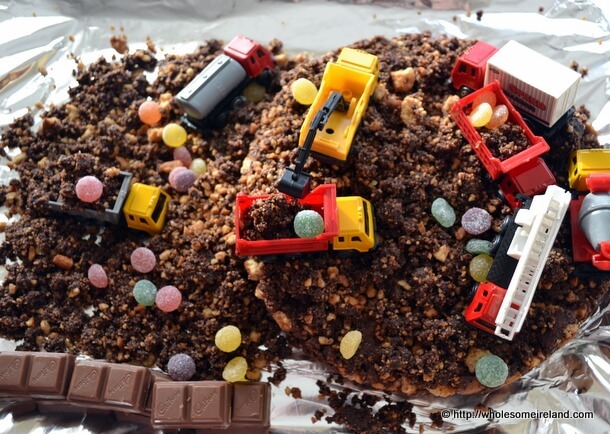 Sprinkle the biscuit crumbs from the baking tray on top of the cake then jelly tots (buried treasure), build a wall with the chocolate blocks and position the trucks where ever you like. I love this. It’s going to make a certain 3rd birthday celebration in December very special! It’s a great idea! I’m sure he loved his cake and at the end of the day, what they like is for it to look fun and this one surely does!! Thanks Mummyflying solo we had great fun making it! It’s just great! My kid’s bday is in 10 days time…. I’ll definitely try this! Oh do, they’ll love the imagination & flavours! Ah thanks Dawn, I’m glad you like it! I don’t see any reason why not!